Now notebook computers are particularly common, whether in the outdoors or in the room to be used, especially in the outdoors, the laptop is fully powered by the battery. Over time we will find the battery life has not just started so long, before you can use 3 hours, now only two and a half hours of life. How is this going? For the use of time within 1 year of the battery, lifetime is shorter, often not because of the battery aging, but because of the battery in a number of charging and discharge process, the notebook BIOS system on the battery power misjudgment. The battery has a certain amount of electricity, but the BIOS is mistaken that the power has been exhausted so that books forcibly shut down. If there is such a battery lifetime shrinking, first of all, do not be busy to conclude that the battery quality problems, and can be “battery calibration” this simple way to make the remaining power to fully play out. There are three ways to calibrate the battery: usually use the battery calibration procedure in the BIOS, manually calibrate the battery, and use the third-party battery calibration software. Here mainly talk about the first two correction methods. Tips: Do not recommend using third-party battery calibration software. As for the reasons, the first need to install third-party software, not the first two methods are simple; Second, in fact, behind the principle of correction is similar to third-party software and not too much unique place, but also there are potential security risks. So in the first two methods can be completed through the case of battery calibration, do not recommend the use of third-party software. Many brands of notebook computers in their BIOS which are integrated battery calibration procedures, the general English is called “Battery Calibration”, that is, “battery charge proofreading.” Directly into the BIOS will be able to complete the battery calibration operation, where the ASUS notebook, for example, how to operate, other books similar to the operation. Step 1: boot, press the press (F2) to enter the BIOS menu; through the left and right arrow keys, select the Enter Power menu. Step 2: enter the Power menu, you can see the “Start Battery Calibration” option (Figure 1), select it and press the Enter key to execute. Step 4: This process takes some time, such as battery exhaustion automatically shut down, and then connected to the power adapter to charge the battery, but do not boot. After the completion of charging (charge indicator light off), the battery calibration process to be completed. Edit Comment: This operation is more official battery calibration method, the whole process takes about 4-5 hours, more time-consuming. If you find that your laptop battery is useless for a long time, such as a few months, a lifetime as the original, and the BIOS with this feature, it is recommended to implement laptop battery calibration. 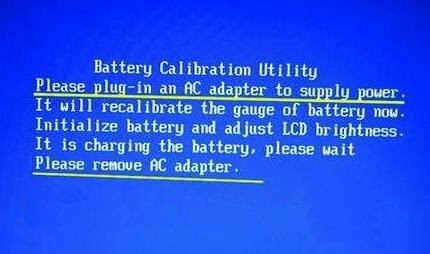 Some notebook, in the BIOS, how to find cannot find the battery calibration options. Is this kind of notebook cannot carry out battery calibration? In actual fact, we can “cottage version” of the battery calibration method to operate it. Is called “cottage”, because this is not the official method of publication, but through some of our manual settings, so that books in the normal work of discharge until the automatic shutdown. If your battery calibration issue is still not resolved then connect to UAE Technician expert for any type of computer or laptop battery issue. Our Technician expert will provide your best battery repairing solution with a very affordable budget.